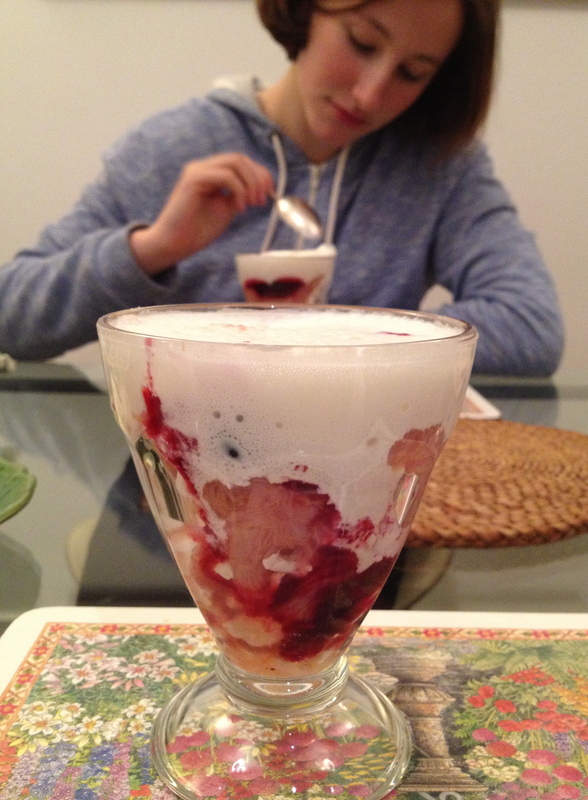 Eton mess is classic and as such not to be trifled with (HiHi! ): it is perfect as it is and I give you a spring version with the lovely pink rhubarb which we are getting now and some (frozen?) raspberries. Cut up a few stalks of blushing rhubarb and leave them to melt in just a spoonful of water, over the hob. Add some sugar over the stewed fruit and cook a little to infuse. Sugar to taste but remember the mix needs to keep zingy so be timid! Reserve until cool. The frozen or fresh raspberries can be added at that point and crushed into the rhubarb or later used to decorate the top. Prepare a Chantilly either with your trusted siphon or a mundane whip: that is whipping cream, a spoonful of caster sugar and drop of vanilla essence. I am known for adding rum to most of my Chantilly mixes but this pudding does not need any… As I said: it is perfect as it is and should be kept that way. Break off bits of crunchy meringue (shop bought is fine- I am hopeless at meringue making) into a sundae glass or an ice-cream bowl. Layer some rhubarb stew, then some whipped cream. Add some smaller bits of meringue and decorate with a few raspberries on top, then a last splurge of whipping cream which you whirl up with a fork for a marbled effect with the fruit sauce and serve straight away. A very much loved classic English pudding. The more traditional version is made with strawberries and used to be served during the annual cricket match between Eton and Harrow. Now that the cricket term has started it seems a good enough reason to enjoy this- be it at a school picnic or elsewhere! Inspired today by the lovely italo-french blog “Un dejeuner de soleil”. Go and visit for the French and Italian versions and for the gorgeous pictures.